Infographics are a great way to compress a lot of data or relay a complex process in an appealing and approachable format, but that’s not their only strength. One Brafton client saw that infographic marketing improved engagement metrics across the board, but more importantly, got viewers to convert by clicking call-to-action buttons on landing pages where they were hosted. You might like infographics because they condense a panorama of data into a single snapshot. You may love them because they’re clever, entertaining and attractive. But they’re effective marketing tools and this example shows why. The client’s infographic featured a series of illustrated data points using healthcare stats – information that it knew was valuable to providers and pharmacists, the client’s target audience. Without illustrations the figures would have been just as compelling, but the added visuals captivated the audience and got viewers to invest in the story it was telling throughout the piece. It kept them glued to the screen and the brand’s message. Engagement metrics prove the piece’s power: The bounce rate on the infographic was almost 12 percent lower, and the exit rate was 40 percent below the site average. This means visitors who got to the infographic’s landing page didn’t just look and leave – they stuck around to hear the story and then opted to learn more about the business and what it offered. 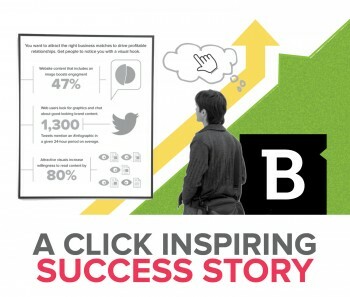 The engagement was one positive improvement, but the company also generated leads from the infographic. Metrics showed that people going to the infographic were more likely to click the related CTA (to request more information about products), resulting in a 26 percent clickthrough rate (CTR) on average. In clicking the CTA button, these viewers were diving deeper into the company’s product landing pages where they could learn more about its offerings. The infographic contributed to the client’s overall conversion rate, which surged as the site generated twice as many leads for the company during a single reporting period. Alone, the graphic might not have doubled the number of visitors who converted, but it was part of a winning strategy that wooed visitors with the information they wanted and nurtured their interest with a meaningful narrative.